The first volume of the Propaganda Photo Series, a unique series of books on World War II small arms. Each volume covers all essential information on history & development, ammunition & accessories, codes & markings and contains photos of nearly every model and accessory. The most important quality of the Propaganda Photo Series however, is a unique selection of original German World War II propaganda photos, most never published before. The combination of solid information and original photos makes the Propaganda Photo Series the most extensive and reliable source of German small arms"in-use", depicting the weapons and equipment as they were actually used. 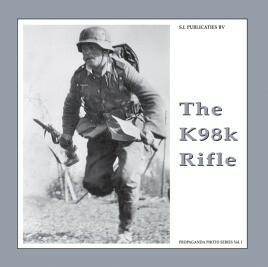 This book describes and depicts the K98K rifle, the"workhorse" and most important small arm of the German armed forces during World War II. It contains a detailed description of the history, use and accessories of this rifle, but also covers the sniper rifles, rare variants and special accessories as the curved barrel device and the silencers.